Last weekend at UFC Rio, Brazilian referee Eduardo Herdy stopped a bout and awarded Leandro Silva a supposed submission victory when his opponent neither was unconscious nor did he verbally or physically tap out. 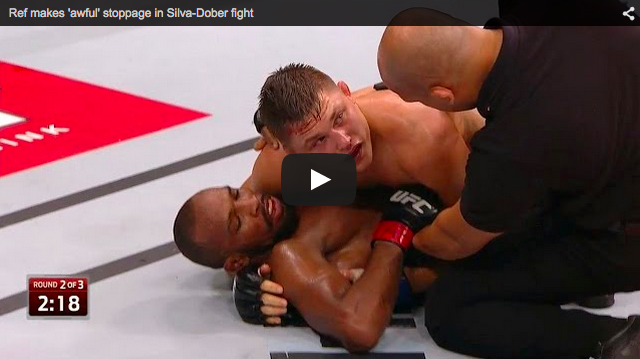 That call which is arguably the worst call in UFC history left a sour taste in the mouths of not only Drew Dober, who was on the losing side of the decision, but also the fans and UFC President Dana White himself. Dober was working his way out of an arm-in guillotine from top Half Guard when the referee ended the contest. The regulatory body in Brazil, Comissão Atlética Brasileira de MMA (CABMMA) initally said they would not rule the bout a no-decision. “There is no action CABMMA can take at this time, and the result will be maintained,” said chief operating officer Cristiano Sampaio, citing their adherence to the Unified Rules as interpreted by the Nevada State Athletic Commission. Campaio said a result could only be changed if there was a math error, or collusion, of if the referee did not understand the rules. New Jersey State Athletic Control Board counsel Nick Lembo, NJSACB commissioner Larry Hazzard, and California State Athletic Commission Executive Director Andy Foster all indicated that something could be done and that is when Sampaio reversed the decision, and the bout will be declared a No Contest. According to Combat Sports Law CABMMA has changed their rules to allow such overrides going forward.